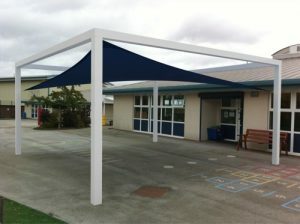 What Are The Benefits Of Shade Sails? &ndash; Protection from harmful UV rays. Exposure to UV rays increases the risk of developing skin cancer. By minimizing your UV exposure when you are outdoors through the use of one of these sails, you can also reduce this risk. &ndash; A cooler outdoor environment. When the sun beats down on a space, the temperature naturally goes up. If you have ever walked out on a patio on a hot, sunny day, you probably have noticed just how warm it can get. The sunlight reflecting off of the concrete can turn your patio into an oven, making it uncomfortable to spend time outdoors. Installing a sail over the area can help keep it much cooler. &ndash; Lower air-conditioning bills. If you strategically mount your sail to provide shade for your home, it can make it easier for your air conditioner to keep your house cool. This can result in lower energy bills during the summer months. &ndash; Affordable. Compared to the cost of other options like awnings, patio sails are extremely inexpensive, making them a budget-friendly option. &ndash; Easy to install. You don’t need a lot of tools or experience to install one of these sails. Instead, as long as you can find good anchor points near your patio, you can have the sail up within very little time. &ndash; You don’t have to worry about them tipping over in the wind. If you rely on patio umbrellas for shade, you have to make sure that they are closed every time it gets windy so that they don’t fall over. That isn’t a problem with these sails. Shade sails provide countless benefits, making them a great investment for your home.